Two slaves free themselves from a slave ship, one a Japanese man, the other an African American. After escaping they find themselves on the shore of Edo-era Japan, a society with a strong caste system, isolated from the world. How will the Japanese people perceive this giant black man, how will they survive? But first things first, how will they get these shackles off their feet? 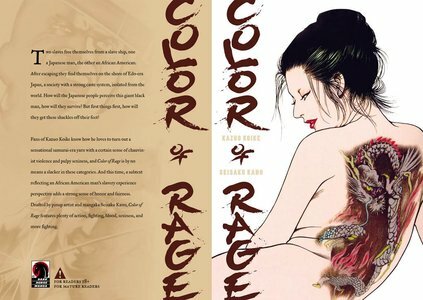 Fans of Kazuo Koike know how he loves to turn out a sensational samurai-era yarn with a certain sense of chauvinist violence and pulpy sexiness, and Color of Rage is by no means a slacker in these categories. Drafted by pin-up artist and mangaka Seisaku Kano, Color of Rage features plenty of action, fighting, blood, sexiness, and more fighting.